Actor Jussie Smollett is escorted through a thick crowd as he leaves the courthouse following his bond hearing. The sequence of events reads like the plot of a television show: A man stages his own attack and rehearses it beforehand, making sure there's a surveillance camera nearby to record it. But prosecutors say it really happened. They allege "Empire" actor Jussie Smollett hired two men to orchestrate what appeared to be a racist, homophobic attack on himself in Chicago on January 29. Smollett hired brothers, Olabinjo and Abimbola Osundairo, and paid them $3,500 to stage an attack, Chicago police Superintendent Eddie T. Johnson said Thursday. Smollett reported the attack to police who investigated it as a possible hate crime. 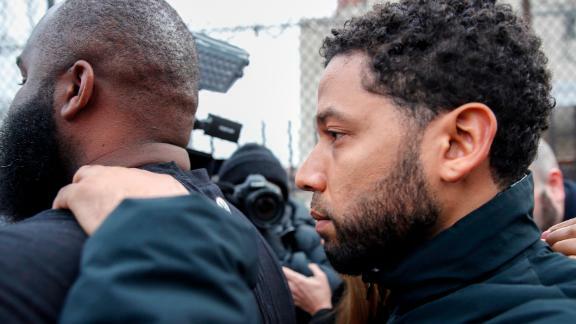 But as the story unfolded over the weeks, its numerous twists and turns culminated with Smollett's arrest Thursday on suspicion of filing a false police report. The alleged plot's electronic trail dates to January 25 when Smollett texted Abimbola Osundairo and said, "Might need your help on the low. You around to talk face to face?" prosecutors alleged. He gave the brothers directions on the staged attack and told them to put a noose around his neck and shout "'Empire' fa***t" and "'Empire' n***er," as well as to make a reference to "Make America Great Again," prosecutors allege. After laying out the plan and rehearsing it, prosecutors said, Smollett gave the brothers a $100 bill to buy clothing and rope for a noose. The staged attack went ahead as planned, with the brothers mildly punching Smollett with gloved hands, according to Johnson, the police superintendent. "As far as we can tell, the scratching and bruising that you saw on his face were most likely self-inflicted," Johnson said. Phone records indicate Smollett talked to the brothers about an hour before the alleged attack, an hour afterward and after they left the country for Nigeria, authorities said. Police initially treated the matter as a hate crime, but they could not find video of the incident from surveillance cameras in the area. "I believe Mr. Smollett wanted it on camera," Johnson said. "But unfortunately that particular camera wasn't pointed in that direction." Even without actual footage, police were able to identify two "persons of interest" and track down the brothers through cabs and rideshares they took afterward, police Cmdr. Edward Wodnicki told reporters. They found evidence connecting Smollett to the men prosecutors say staged the attack, and investigators met the brothers at customs when they returned to the United States, Wodnicki said. Olabinjo and Abimbola Osundairo asked for an attorney once in custody, Johnson said. The men told officers that Smollett, who is black and gay, first "attempted to gain attention by sending a false letter that relied on racial, homophobic and political language. When that didn't work, Smollett paid $3,500 to stage this attack," the police superintendent said. The revelations necessary to charge Smollett came during the 47th hour of a 48-hour holding period for the two men, who eventually confessed to the alleged plot, Johnson said. After cooperating with police, the two were released without being charged last week and went before a grand jury Tuesday, Johnson said. Investigators believe Smollett staged the attack "because he was dissatisfied with his salary," Johnson said, citing information that the Osundairos gave to police. The actor took "advantage of the pain and anger of racism to promote his career," Johnson said. Smollett has maintained that he did not make the story up. A source told CNN that as recently as Thursday, he reiterated to the "Empire" cast and crew he was innocent of the charge against him. "Given these circumstances, we intend to conduct a thorough investigation and to mount an aggressive defense." In a statement released Thursday night on behalf of the actor, his attorneys described the bail hearing as an "organized law enforcement spectacle." The judge granted a $100,000 bail, and Smollett paid a $10,000 bond. He was ordered to give up his passport and will remain under supervision until his case is adjudicated. "Mr. Smollett is a young man of impeccable character and integrity who fiercely and solemnly maintains his innocence and feels betrayed by a system that apparently wants to skip due process and proceed directly to sentencing," the statement said. During Thursday's news conference, Johnson repeatedly chastised the media for devoting more attention to the Smollett case than to other victims of violence in the city. "I am offended by what's happened and I'm also angry," Johnson said. "Bogus police reports cause real harm. They do harm to every legitimate victim." The superintendent said, however, that Smollett was given no more attention than any other alleged crime victim, but he lamented that resources devoted to this investigation could have been deployed elsewhere. Some on social media expressed anger at Smollett for potentially tarnishing the public's trust in victims moving forward. Others offered a more optimistic perspective. Sen. Kamala Harris, who last month described Smollett's attack claim as an "attempted modern day lynching," said she's frustrated and disappointed by the turn of events. "When anyone makes false claims to police, it not only diverts resources away from serious investigations but it makes it more difficult for other victims of crime to come forward," Harris wrote on Twitter. 20th Century Fox Television and Fox Entertainment initially stood behind the actor and his role on "Empire," but his future is now under review. "We understand the seriousness of this matter and we respect the legal process," they said in a statement to CNN on Thursday. "We are evaluating the situation and we are considering our options." Under Illinois law, filing a false police report is disorderly conduct and punishable by one to three years in prison. Smollett is due back in court March 14. Why did prosecutors drop all charges against Jussie Smollett?